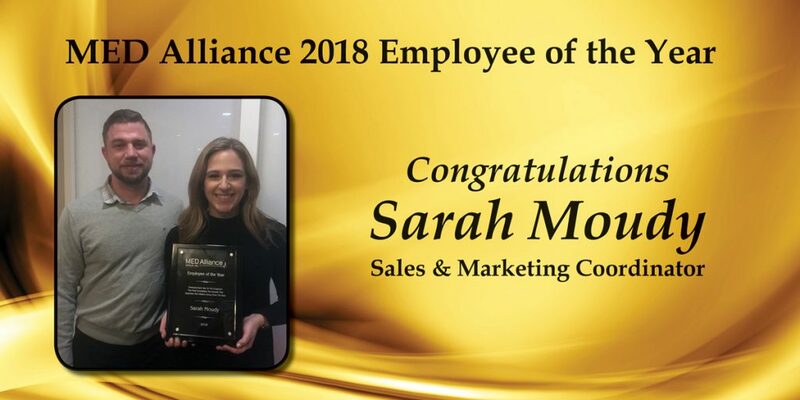 Congratulations Sarah Moudy, MED Alliance 2018 Employee of the Year - MED Alliance Group, Inc.
MED Alliance Sales and Marketing Coordinator Sarah Moudy was awarded Employee of the Year during the annual Holiday party on Friday, December 17. A true team player and an exceptionally hard worker, Sarah was recognized for her dedication and contributions to MED Alliance. Sarah joined MED Alliance in 2017 as a recent graduate of Northern Illinois University. Although her main job responsibilities include promoting MED Alliance Group products and assisting 15 sales representatives throughout the Midwest, Sarah does so much more. Sarah’s positive attitude and commitment toward her responsibilities, co-workers and our MED Alliance customers make her an incredible asset. Not only does she bring a great deal of talent and quality to her marketing and sales responsibilities, she is also dependable, helpful and caring. Sarah embraces change and innovation and takes it upon herself to ensure others are ready for what is to come. Congratulations, Sarah, for a well-deserved award! We are very lucky to have you as part of the MED Alliance team! MED Alliance Vice President of Sales presents the 2018 Employee of the Year Award to Sales and Marketing Coordinator Sarah Moudy.